Which of the following angles are supplementary angles? Two angles are supplementary angles when these angles add to 180°. Hence, angle I and III are supplementary angles. This is because 101° add with 79° gives 180°. 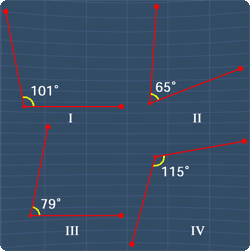 As for angle II and IV, they are also supplementary angles. This is because when we add 65° with 115°, we get 180°. Clearly, I-III and II-IV are supplementary angles. Hence, the answer is C.